The Hague, 5 April 2017 – The rehabilitation of Kılıç Ali Paşa Hamam in Istanbul has received a Europa Nostra Award 2017. The public announcement was made today by Europa Nostra, the leading heritage organisation in Europe. The Europa Nostra Award is presented to outstanding achievements from European countries not taking part in the EU’s Creative Europe programme. This award-winning achievement from Turkey will be honoured – together with this year’s winners of European Union Prize for Cultural Heritage / Europa Nostra Awards – at a ceremony to be held on 15 May in the historic city of Turku, Finland. The renowned opera singer and President of Europa Nostra Plácido Domingo will host the European Heritage Awards Ceremony together with the European Commissioner for Education, Culture, Youth and Sport Tibor Navracsics. The objective of this restoration project was to reinstate the structural, material and formal characteristics of this Sinan-period architecture that was lost over the preceding centuries and to revive and update its functional purpose, that is, as a traditional Ottoman bathhouse. Like many medieval structures in Istanbul, the Kılıç Ali Paşa Hamam has suffered extensive damage from earthquakes, especially to the dome, as well as subsequent negative effects from unsuitable maintenance measures. Alongside the necessary repair of the seriously damaged surfaces and the fortification of structural elements, a key task in this restoration project was the identification of original elements of the Sinan design which had been partially or entirely obscured by later additions. These later additions, generally having been incorporated to cater to the changing demands of the Hamam’s customers, had negatively affected the rich spatiality of the original design. Wooden dressing rooms and lockers which were added to a previously open platform enveloped the entire interior space and hindered the view of the main dome. In the restoration, these later additions were removed and replaced with a non-obtrusive design solution to meet the needs of the customers and to preserve the architectural integrity of the space. The Jury noted that “this living heritage site has been revitalised with a combination of expertise in architecture and craftsmanship. It is a prime example of an Ottoman bath and the success of this project has considerable power of example”. 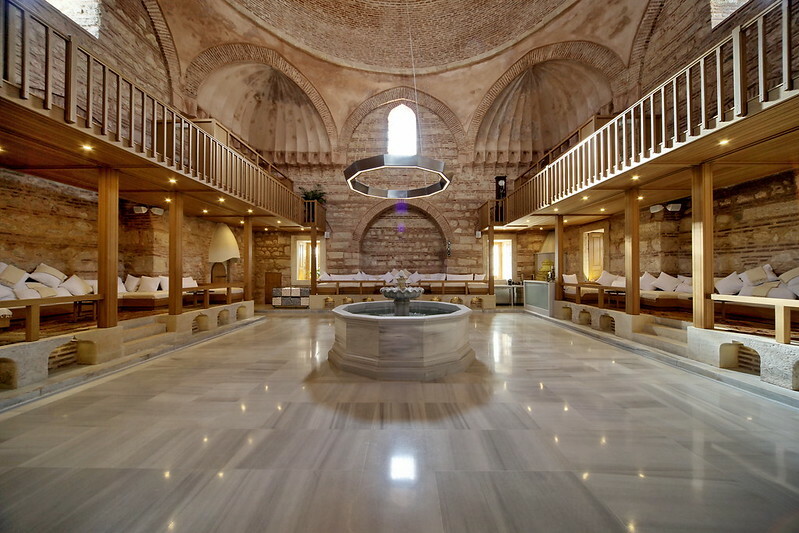 The project was initiated and privately funded by the owner, Mr. Nureddin İren, whose desire to return the Hamam to its original function in a respectful way was implemented by Mr. Cafer Bozkurt and his architectural team. “This is an important building by the iconic architect Mimar Sinan in central Istanbul which has been expertly restored with the use of traditional techniques and crafts, especially in the restoration of the dome. There is fine attention to detail evident throughout this project, for example, in the restoration of the original shoe lockers in the frigidarium, which speaks volumes about the dedication of the team to restoring the Hamam as close to its 16th-century interior as possible”, added the jury.